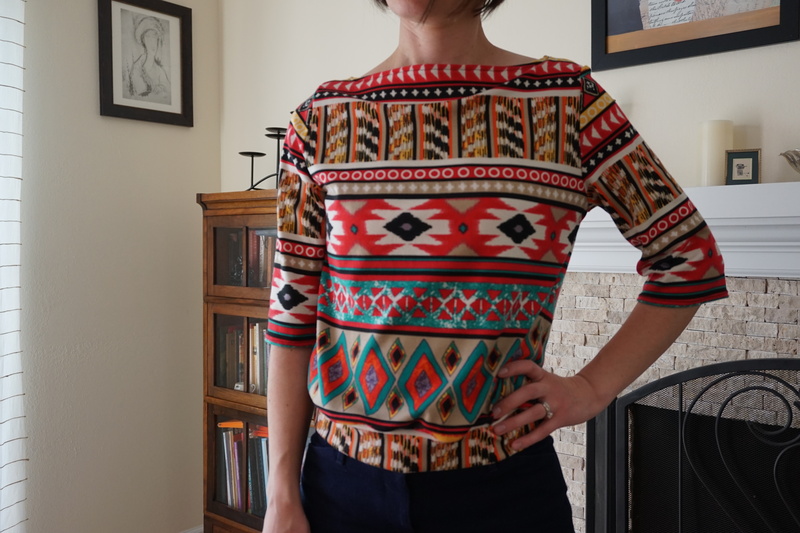 I finished my first vintage pattern for #vintagepledge! I actually finished it awhile ago, and many other projects, but I’m finally getting around to sharing it! I used a ponte de roma from Girl Charlee called Emerald Green Red Ethnic Diamond Rows. It was easy to work with, and really not typically something I would’ve chosen for myself. I actually bought it to make something for someone else, then changed my mind. 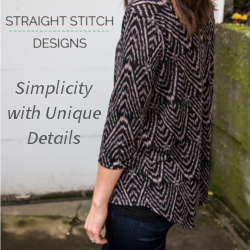 Simplicity 6432 has several options to choose from, and with the weather warming up, I chose option 4 in a size 10. Construction was simple; I mostly followed the instructions provided which were clear. I did have some issues with my markings though, and completely ignored them while serging the shoulder pieces. This made attaching the yoke according to the instructions impossible, but that was ok, I just did that part my way. I did make some changes to the fitting though. I didn’t do a tissue fitting at all, so when I sewed together the muslin, there were some enormous fitting issues. The back of the neckline was so high and stuck out a lot. I didn’t stop to take any pics unfortunately, but believe me it was AWFUL. I folded it down until I liked the neckline in the back, and resewed the neckline. 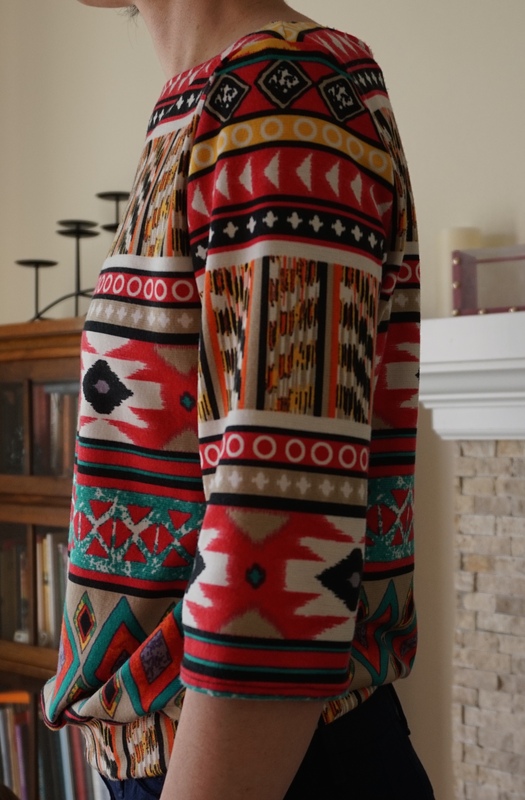 I couldn’t really detach the yoke from the back piece, so I had to cut it partially, which unfortunately makes the back neckline flip outwards when I wear it because of the original stitching. The front neckline is a bit high as well for my liking. I left it alone for this top because of the print, but I think for my next version I’ll lower it about an inch or more at the front. You can see the fold in fabric when I put my arm on my hip. I also thought the length was a bit on the shorter side, so I think I’ll also make my next version longer. I’ve sewn a few other things for myself in the meantime, and I’m thinking the back neckline issue might actually be a fitting problem for me. I need to sew something woven with a fitted bodice to be sure, but I’m thinking I may have a forward head and high round back. Maybe I’m just stretching the neckline when I’m sewing it up though, since I’ve mostly been sewing knit tops for myself. Maybe if I use my walking foot it’ll solve the problem? It seems like a lot of stretch and sticking out in the back of the neck though. Any thoughts? I definitely want to revisit this pattern though. As for the fabric, I think I’ll be cutting that up into a top for one of my girls. On a side note, I’ve actually been very sick for weeks, catching anything and everything under the moon. This resulted in quite a bit of lost weight so my measurements have all changed. I’m thankful this happened before I made myself lots of clothes! Next PostNext 2015 OAL is Here!